Feel free to share the post on social sharing sites, but please do not copy and paste this information. 2:30pm-4:00pm Trick-or-Treating, Creepy Crawly Arts & Crafts and Spooky Temporary Tattoos. 4:00pm-8:00pm Eat delicious treats and participate in a Mummy Wrap Contest and FANGtastic Face Painting. 5:00pm-7:00pm Join us for Trick-or-Treating, Creepy Crawly Arts & Crafts, Bewitching Games and FANGtastitic Face Painting. 1:30pm-2:30pm PET COSTUME PARADE Located at the Dog Park. Sign-up at the Bike Barn by Sunday, October 30 at 5:00pm. Arrive 15 minutes prior to start. 6:30pm-7:30pm HALLOWEEN AWARD PRESENTATION Located at the Campfire Theater. Awards will be given for Campsite Decrating and Golf Cart Parade winners. S U M M E R H O U S E , O N T H E B E AC H NEAR BIG PINE KEY 6:00pm-9:00pm Pumpkin Patch, Decorate Your Own Pumpkin ($), Mummy Wrap Contest, Halloween Mickey Tie-Dye, Trick or Treat, Make Your Own Ice-Cream ($), Character Meet and Greet, Monster Bash Dance Party and a DJ! 4:00pm-7:00pm Join us for for Halloween Mickey Tie-Dye ($), Monster Bash Dance Party, Bewitching Games, Costume Contest, Trick-orTreating, and Character Meet and Greets. 7:00pm-8:30pm Watch a Halloween double-feature of Walt Disney Animation Short Films “Toy Story of Terror” and “The Adventures of Ichabod and Mr. Toad” while roasting marshmallows around a Chilling Campfire. 6:00pm-9:00pm Join us for activities in the Lobby Courtyard for a Monster Bash Dance Party, Bewitching Games, Costume Contest, Decorate Your Own Pumpkin ($), and Character Meet and Greets! 4:00pm-6:30pm Character Meet and Greet with delicious treats! 1:00pm-9:00pm HALLOWEEN CONTEST Cast your vote in our Candy Counting Contest at the Silver Creek Springs Pool for your chance to win a prize! 6:00pm-9:00pm Join for trick-or-treating across the Resort! Stops include the Front Desk, Wilderness Lodge Mercantile, Whispering Canyon Cafe, Artist Point & Silver Creek Springs Pool. Previous PostSave Up to 25% on Rooms at Select Disney Resort Hotels!Next PostWorldwide Wednesday: Halloween Time trip report including Cheshire Cat Meet and Greet! Actually, this says Monday the 31st a few times which is actually last year. This year October 31st is on a Tuesday… have they released what they are doing for Halloween yet? I pulled up Pop Century and they didn’t have any Halloween activities listed on their Rec calendar. Does this mean they won’t be any trick or treating, etc? When will we see 2017 resort activities for Halloween? Staying at Pop and checking in On the 31st. Already there. Just cick on an image or download the pdf. Previews are messed up. I may just switch to links because of that. Oo also we’re staying at AKL but is it possible to take part in the other resort offerings or will I only be able to attend the stuff at AKL and maybe kidani? You could take a cab or uber to other resorts, if you wish. Hi – how far in advance do these details usually get released (aka when can I expect a similar list for 2017)? Also do any of the parks (other than MK) do anything special on Halloween? Begining of October. Would be on my resort activities guide. No other parks do anything. Is this something done every Halloween? We will be at POR for Halloween 2017 as our first day in the park. I was going to get tickets for the Mickeys Not So Scary Halloween Party but am I better off skipping and just trick or treating at the resort? Is the party way overcrowded on Halloween night? Yes it will be on my recreation guides. Totally different things. Do you know if this will extend into November? But with a Christmas theme, obviously. If we have Club Villain reservations for 5:15, do you think we could still make it to Fantasmic, for a 7:30 showing? What king of parade do they have at Art of Animation? Do the kids participate in a costume parade or is there floats? I’ve not seen this before, likely just a costume parade. Do the hotels in Disneyland Resort do this as well? If yes, do you have that schedule for each hotel? Last year The Headless Horseman appeared at one DVC resort. On Hallowen. Do you know if this is planned again this year? Will you have info on which characters will be at the resorts on Character Locator? No, specific characters are never provided in advance. 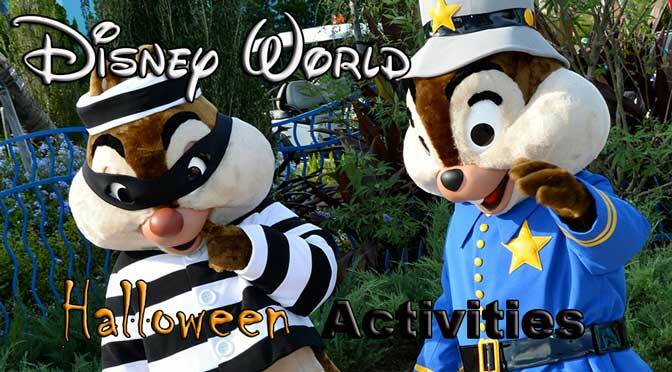 Are these activities intended for Walt Disney RESORT GUESTS? Anyone can enjoy these. Resorts are always open to visitors. We go resort hopping every single Halloween and Easter. Is this offered only on Halloween day or on other days leading up to Halloween?